Welcome to Hooked on Walking holidays and our self-guided walking holidays in Germany. A fascinating country to take a hiking vacation whether you’re looking for stunning mountain scenes, quaint villages steeped in history with their charming and unique architecture, fairy tale castles and medieval landscapes, Germany’s famous beer culture, or its celebrated and renowned wines of the Rhine and Mosel regions. Our walking tours of Germany are for all holidaymakers interested in exploring this beautiful land and not only experienced and seasoned hikers. Whether you’ve never embarked upon a walking tour before or you’ve hiked through more countries than you can recall off the top of your head, our walking holidays in Germany are for you. As our walking tours of Germany are of varying grades to suit all hikers, you’re sure to find a tour that appeals to your degree of fitness, your hiking experience, and of course your interests. After all, the best walking tours are those that are not only suitable for participants physically, but are also stimulating on a more personal level. What do you hope to see on a walking tour in Germany? Our hiking experts have developed a variety of walking tours which we believe take in the very best that Germany has to offer. And those who’ve embarked upon one or more of our walking tours wholeheartedly agree! Our guided and self-guided tours take in beautiful landscapes and delightful villages and towns in regions as famed as Bavaria and the River Rhine, with each offering something slightly different and unique to the others in terms of culture and scenery. From the strikingly beautiful blue-green Lake Königssee in Bavaria to the fairy tale castles that seem to hang precariously from the cliffs overlooking the River Rhine, our walking tours showcase the timeless beauty of this remarkable European land. But our walking tours are not only about sights, they’re also about experiences. So, what do you hope to experience on one of our expertly developed walking tours of Germany? If you have your heart set on experiencing the renowned beer culture for which Germany is famed you won’t be disappointed, nor will you be disappointed with your gastronomic experiences that will impassion and excite your taste buds. Whilst Germany is renowned for its beers and wines, it’s also a well-known fact that its gastronomic offerings are among the most fantastic in all of Europe and offer so much more than sauerkraut and bratwurst. And in addition to wining and dining, Germany also has much to offer those with a love of history, whether that’s modern history and the Great Wars of the 20th Century, or medieval history up to and beyond the Treaty of Westphalia that ended the dreadful Thirty Years War. 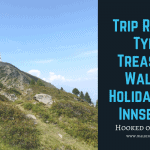 To learn more about Hooked on Walking’s walking holidays in Germany, please click on the links below. You’ll find detailed itineraries of each walk, what’s included, the available extras, our latest rates, and information about getting there and away. Walk the King Ludwig Trail in Bavaria. Adventurous and sensational crossing of gorges, thundering waters leaving unforgettable impressions. You will see many castles hanging cliff edges and amongst the forests, lovely little villages, medieval towns , vineyards and breathtaking views across magnificent river scenery. Enjoy a week-long holiday walking along the Moselle and Eifel Trails. On the Jacobs Trail you will walk on quiet country roads, forest trails and walking trails. Discover on foot Bavaria’s most beautiful clichés during a week-long walking tour between Bad Tölz and Bayrischzell. Available daily from 5th May to 20th October.